With mobile devices all the rage now, is it possible to blog via your mobile phone? 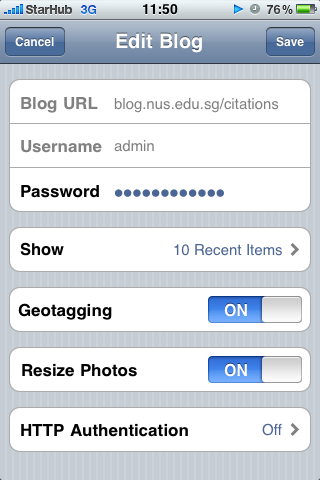 Since Blog.nus is based on WordPress, the free WordPress app will work. Please check that your device is supported! I can’t guarantee the apps will work with all devices. Before you download and install the app on your device, go to your blog’s Dashboard > Settings > Writing. Under Remote Publishing, make sure you Enable the WordPress, Movable Type, MetaWeblog and Blogger XML-RPC publishing protocols. You can customize some other settings as shown below. The screenshot is from the iPhone, but the set up should be similar for other devices. If you are an iPhone user and maintain blogs on other blog platforms, you may want to check out BlogPress in the App Store. Do note that BlogPress is a paid app!